I was in Cathe Pacific - Cottage by the Beach of Ms. Cathe Duero in Cantilan, Surigao del Sur with fellow travel bloggers (journeying james, love mindanao, escape manila, and wandering soles) when I heard/read the news about super typhoon"Pablo" expected to hit Philippine Area of Responsibility specifically Mindanao this week. Timely, I received this helpful PR about Disaster Preparedness from Eveready Philippines. Have time to read and please do share. IBA NA ANG LAGING HANDA! The height of the wet season in the country isn't getting much help from the spate of other natural disasters like earthquakes and a string of typhoons. While such upheavals may be considered normal because of our orientation along the so-called Pacific Ring of Fire, there’s the even larger context of climate change whose impacts are felt all the way around the world. Climate change or global warming has become evident in recent years as regions experience extreme climates, from warm seasons hitting record-high temperatures to wet seasons exhibiting massive precipitation. This is precisely the reason why organizations from both the public and private sectors call for extra vigilance. The first thing to do at the onset of any calamity is to keep watch over the situation regardless of whether you are located near disaster-prone areas or not. This means keeping constantly updated with breaking news about the progress of the storm and related developments over television or radio. It also helps to be oriented on PAGASA’s Public Storm Warning Signals (PSWS) as well as their recently released color-coded rainfall advisory, which would help people be ready for any possible situations. While PSWS corresponds to increasing storm intensity from PSWS#1 to PSWS#4, the rainfall advisory tracks the level of rainfall that determines rising water levels. Code Yellow means heavy rain that will deposit about 7.5 to 15mm of water—a situation that requires constant monitoring of the weather condition because of the possibility of flooding. Code Orange, on the other hand, means intense rain that will deposit about 15 to 30mm of water. This code requires people to be alert for possible evacuation due to threat of floods. Code Red, like any other red-alert status, means danger. With more that 30mm of rainfall, low-lying areas are to expect serious flooding that would require residents to immediately evacuate. Knowing these facts offer foresight and provide a chance to be always ready for possible disaster. Being ready means having ample time to strategize on which areas to avoid, how to safeguard property, or, at worst, evacuate the premises. Securing the basic necessities of food, shelter, and clothing is of utmost importance. Making sure that the household is secure and waterways are free of debris are essential, as is stocking up on provision like bottled water and food that have a long shelf life. An emergency kit that includes a multitool knife, First Aid materials, transistor radios, and flashlights should be accessible at all times. Cell phones should be charged in case of power interruption and emergency numbers must be on hand. It’s also important to stock up on long-lasting batteries. Aside from powering radios for information and flashlights for navigating through the dark, a good set of batteries powers signaling devices that can spell the difference between getting rescued and being left behind. Eveready, the country’s leading battery brand, took the initiative to equip emergency response units like the Philippine Red Cross and the National Disaster Risk Reduction and Management Council with hands-free Energizer Headlights and Batteries needed to conduct rescue and relief operations. Through partner organizations GMA Kapuso Foundation and ABS-CBN Foundation’s Sagip Kapamilya, Eveready also provided emergency lights and battery energy to families affected by massive flooding during the recent southwest monsoon (habagat) rains in most of Metro Manila and large parts of Luzon. I agree. 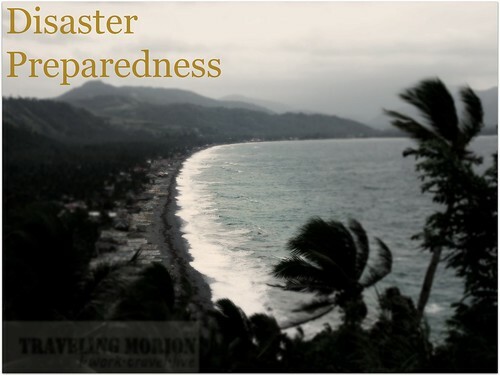 There has to be a year-round, family-based preparedness in areas most prone to disasters. Great post this is Sir Jeff. I have attended last time to hear the Climate Change Report in Bukidnon at the Provincial Planning Development Office. That's the time that I knew that there is an increase of temperature to 1 degree celsius from 2010-2020. Walang ng urungan ito. But there is still solution pa daw, plant more trees.